Short non sensing range and it is ideal for short distance (0.06m at min) measurement. Compact and excellent corrosion resistance. For connections, screw-in, flange types are available. The sensor is made of PFA resin that offers excellent resistance to chemicals. 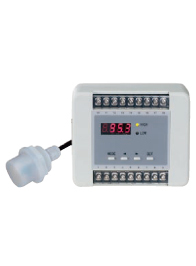 Short non sensing range and it is ideal for short distance measurement. High resolution 0.1 mm allows space saving by compact sensor and main housing. Ex. : Detecting levels in small tanks. Detect substances.